FDW 8'x 5'BBQ Grill Gazebo Barbecue Canopy BBQ Grill Tent w/Air Vent by FDW at The Net Stores Network. Hurry! Limited time offer. Offer valid only while supplies last. Description: It is a nice choice for a backyard barbecue with your friends and family. 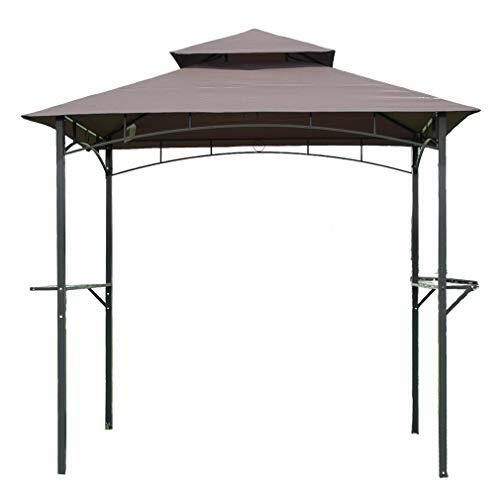 The roof-style grill gazebo is quick and easy to install. It is a nice choice for a backyard barbecue with your friends and family. The roof-style grill gazebo is quick and easy to install. It's made with a heavy-duty steel frame that's lightweight, strong and resists scratches and rust. This brown gazebo has a two-piece side bar for holding grilling accessories. It is designed to keep you protected from the sun and also ensures the food on the grill is safe from the elements. The canopy is made from a 180G polyester material that is non-fading and mildew- and stain- resistant. It includes anchor holes for a secure installation. Powder-coated metal frame resists rust and corrosion to ensure that it stays looking new and fresh. Heavy-duty steel construction ensures stability and protection against the wind. Metal Tray and steel hooks.